Dominion received approval from the Federal Energy Regulatory Commission (FERC) to proceed with its Cove Point Liquefaction Project in September 2014. The new liquefaction facility is integrated with the existing resources of the Cove Point LNG Terminal. Dominion’s liquefaction project site is located within the 131-acre fenced area of the existing Cove Point LNG terminal, which covers an overall vicinity of 1,017 acres. The new facilities cover 59.5 acres of the fenced area and are designed to liquefy and export 5.75 million tonnes (mt) of LNG per year. Construction activities on the $4bn project began in October 2014 and the facility commenced operations in December 2017. The scheme is expected to extend the life of the LNG terminal by an additional 15 years. The new facility will feature three liquefaction trains with a combined capacity of 13.5 million tonnes per year of liquefied natural gas (LNG). Japan’s ST Cove Point joint venture (JV), comprising the Sumitomo Corporation and Tokyo Gas, is anticipated to export up to 2.3mt per year of liquefied LNG from the facility. GAIL (India) is also slated to export the same amount from the facility. Both companies will service the terminal for a period of 20 years. 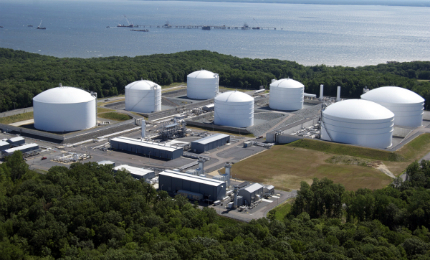 The Cove Point LNG plant has a storage capacity of 14.6 billion cubic feet (bcf) and a daily export capacity of 1.8bcf, making it one of the largest projects of its kind in the US. It started operations in 1978, however, Dominion took over the operatorship of the terminal from Williams in September 2002. The former received the first commercial cargo under its operation in August 2003 and the terminal now employs approximately 100 people. The terminal originally featured four storage tanks, however an additional tank was installed in 2004 and two more followed in 2008. An offshore pier is located at the terminal roughly 1.1mi (1.7km) off the shore of the Chesapeake Bay. The terminal’s 87mi (140km) long pipeline connects with three existing interstate pipelines, including the Transcontinental Gas Pipeline, Columbia Gas Transmission and Dominion Transmission. The liquefaction project primarily involves the installation of natural gas fired turbines to drive the refrigerant compressors. These facilities chill the natural gas to -260° Fahrenheit, which liquefies the gas. Heat generated by the turbines is converted into energy to power the facility. Air Products’ proprietary C3MRTM liquefaction technology is being used at the new plant. This integrates a propane pre-cooled mixed refrigerant liquefaction process and related equipment, including its proprietary MCR Main Cryogenic Heat Exchanger. The gas compression trains for the facility are to be supplied by GE and are being driven by two GE Frame 7EA gas turbines. In addition, the project includes additional facilities at the compressor station, metering and regulating facility (M&R) and discharge pipelines.These are located in Pleasant Valley, and the M&R facility in Loudoun County. Two offsite areas were manufactured at Calvert County in Maryland to assist the construction of the liquefaction facilities. 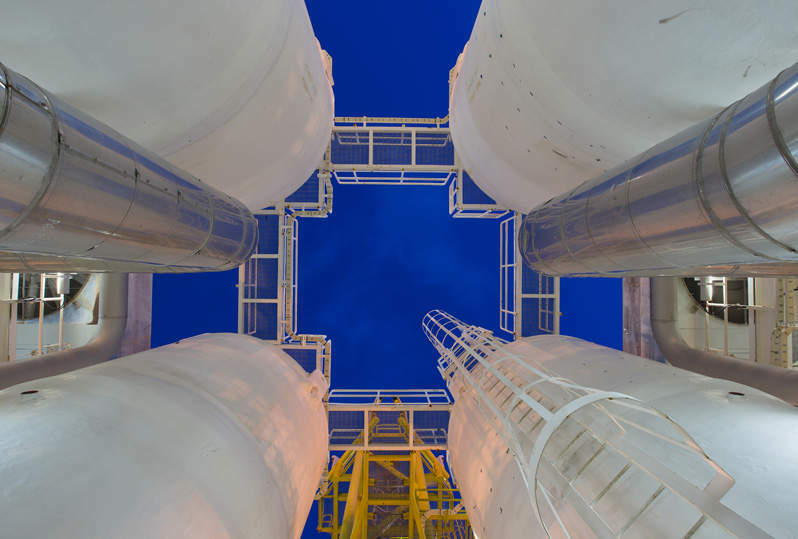 The site’s unloading and loading facilities are being upgraded both on-shore and offshore as part of the development, while an additional air system has been installed at the terminal site, as well as two ground flare systems. A 60ft noise barrier was added around the fenced area to mitigate noise during the construction phase. A JV comprising IHI E&C and the Kiewit Energy Company is acting as the engineering, procurement and construction (EPC) contractor for the project. Both companies completed the front end engineering and design (FEED) activities for the project in January 2013.